Non-threaded terminal HCPM-2-PC-CL/YE, 600V, 24A, 2.5mm2, PC Non-threaded HelaCon Plus Mini 2-hole quick-connect yellow socket for multi-purpose, rigid and flexible wires with a cross section of 0.5 to 2.5 mm2. 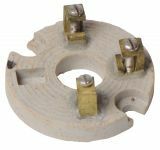 Non-threaded terminal HECE-4-PA66-GY, 450V, 24A, 2.5mm2, polyamide Non-threaded terminal HECE-4 (quick connection) terminal for four wires with a cross section of 1 to 2.5 mm2, load capacity 450 V / 24 A, dimensions 19.7 x 17.2 x 9.5 mm and gray color. Non-threaded terminal HCPM-5-PC-BU/CL, 600V, 24A, 2.5mm2, PC Non-threaded HelaCon Plus Mini 5-hole quick-connect blue socket for multi-purpose, rigid and flexible wires with a cross section of 0.5 to 2.5 mm2. Non-threaded terminal HCPM-6-PC-CL/VT, 600V, 24A, 2.5mm2, PC Non-threaded HelaCon Plus Mini 6-hole (6-hole) quick-connect purl socket for multi-purpose, rigid and flexible wires with a cross section of 0.5 to 2.5 mm2. Non-threaded terminal HECE-2-PA66-GY, 450V, 24A, 2.5mm2, polyamide Non-threaded terminal HECE-2 (quick connection) terminal for two wires with a cross section of 1 to 2.5 mm2, load capacity 450 V / 24 A, dimensions 19.5 x 10.5 x 9.5 mm and gray color. Terminal 3 way/pins, wire splice, orange, push in connector, HelaCon Plus Mini, HCPM-3, 148-90037 Screw less terminal HCPM-3 from series HelaCon Plus Mini by HellermannTyton (148-90037) with 3 clamp positions. This wire splice is suitable for both flexible, multi-wire and solid conductors from 0.5mm2 up to 2.5mm2. RoHS compliant. Terminal WAGO 222-415, 400V, 32A, 0.8~2.5mm2, plastic Non-threaded fifth WAGO terminal for wires of 0.8 to 2.5 mm2 with current up to 32 A and voltage 400 V. Made of plastic size 26.6x20.5x14.5 mm. List Price 1.30лв. VAT Incl. 1.23лв. VAT Incl. 1.17лв. VAT Incl. Terminal WAGO 222-413, 400V, 32A, 0.8~2.5mm2, plastic Non-threaded triple WAGO terminal for wires of 0.8 to 2.5 mm2 with current up to 32 A and voltage 400 V. Made of plastic size 20.5x17x14.5 mm. Terminal WAGO 222-412, 400V, 32A, 0.8~2.5mm2, plastic Non-threaded double WAGO terminal for wires of 0.8 to 2.5 mm2 with current up to 32 A and voltage 400 V. Made of plastic size 20.5x14.5x12.4 mm. Terminal, porcelain 4x2.5mm2 for distributor-box Porcelain terminal for wires with section to 2.5 mm2, four-fold for installing into distributor-box. Terminal, porcelain 3x2.5mm2 for distributor-box Porcelain terminal for wires with crosssection up to 2.5 mm2, three-fold for installing into distributor-box. Lead-acid Rechargeable Battery Terminals, Ф18mm Lead battery terminals with diameter Ф18 mm. Lead-acid Rechargeable Battery Terminals Terminals for lead acid batteries. SLEEVE terminal P8, ф16mm, gray SLEEVE terminals, 16 mm in diameter and gray color. List Price: 0.25лв. VAT Incl. Non-threaded terminal, 2 holes, for cable section 0.5-3.5mm2 Line wires for conductors with a cross section of 0.5 mm2 to 3.5 mm2. Lighting connector WAGO, 400V, 24A, 224-101 Lighting connector. Rated voltage 400 V. Nominal current 24 A.
Лустер-клемите са класически винтови клеми за електрически инсталации. Представляват проходни винтови клеми (вход - изход). Специфичното при тях е, че нямат замоствания и други връзки. В конструктивно отношение, връзката е подобна на характерната за редовите клеми, но обособената тоководеща шина не е задължителна. Най-често тя се слива с контактната скоба. Лустър-клемите се произвеждат като редици от съединени клеми, в общ блок (най-често 12-полюсни). Използват се за свързване на проводници със сечение 2.5 до 25 mm2.